A harmless game of “Truth or Dare” among friends turns deadly when someone - or something- begins to punish those who tell a lie or refuse the dare. Two reasonably good ideas bookend Jeff Wadlow’s film, Truth Or Dare. The first takes a simple, universally recognisable game and turns it into horror. The second I can’t tell you about (because spoilers). Let’s just say it’s a relatively interesting (franchise bait anyone?) narrative development and leave it at that. Sadly, nothing of interest lies between these two ideas. 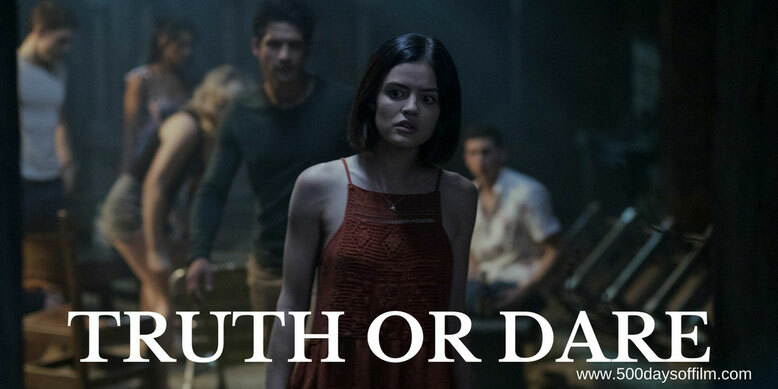 Truth Or Dare - a cross between Jumanji and Ouija with aspirations of Final Destination - just doesn’t have the legs to carry its concept across its one hour forty minute running time. Once the Truth Or Dare concept has been established, the “game” becomes very dull very fast. It’s not scary, it’s not exciting, it breaks its own rules and, critically, we don’t care about any of the characters. How many times have we concluded that we scare because we care? Many, many times. In Truth Or Dare characters are under the very real threat of death and it’s hard to muster any interest whatsoever. Don’t get me wrong, I know that this is popcorn horror. I appreciate that Truth Or Dare has no grand ambitions - that all it wants to do is entertain its audience for a couple of hours. Still, I was actually quite bored. Perhaps I am not the target audience for Truth Or Dare. I haven’t been a teenager in quite some time. In addition, let’s face it, we don’t really care that much about the characters in Friday The 13th and look how successful that franchise has been. Likewise the population of the Final Destination movies. Do we care about the majority of these characters or are they simply a shopping list of kills? However, unlike Truth Or Dare, at least those films were shocking, inventive and willing to get a little nasty. They were also fun to watch. There is potential in the concept of Truth Or Dare but, in the end, Wadlow’s movie fails to deliver. However, that probably won’t stop it from becoming a franchise. Have you seen Truth Or Dare? If so, what did you think of this movie? Let me know in the comments section below or you can find me on Twitter @500DaysOfFilm.